As part of their Sunia Geel 2 programme Exchange House National Traveller Service wanted to showcase the wonderful artworks that were created by Traveller women. It was felt that these artworks depicted the real impact of domestic violence on families. Social Inclusion Week in Dun Laoghaire and Rathdown (11th – 18th October) seemed like the perfect opportunity for these pieces to reach a large audience. 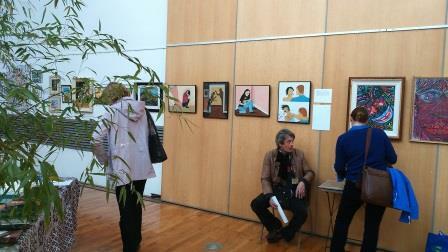 The Dun Laoghaire and Rathdown Ethnic Minority and Integration Forum were hosting the ‘Global Village Project’ on the concourse in the Town Hall and Exchange House contacted them to ask for space to showpiece the artwork and the project as a whole.The artwork was displayed in the centre of the space and was available to view all week. On the 13th October 2014, Kevin Byrne, a social worker from Exchange House attended the ‘walk around’ session of the project. He also gave a short speech on the project and the reason why “we think it is important that the issues of domestic violence are discussed within all cultures”. The artwork was well received and Kevin got the opportunity to discuss the project with the other groups represented on the day. He also felt he learned a great deal about how similar issues are felt and tackled across many different cultures both in Ireland and across the world. Events like this give organisations a real opportunity to share the important work that they are doing and to build relationships with other organisations operating across the area. Exchange House felt that it was a great project and one that we were very proud to be a part of. As part of Sunia Geel 2 we hope to have something new to show everyone in Dun Laoghaire and Rathdown next year.